St. Paul, Minn. – The Macalester College Theatre and Dance Department presents the classic 1945 play, The Glass Menagerie, by Tennessee Williams, in the Janet Wallace Fine Arts Center, Mainstage Theater, 1600 Grand Ave., St. Paul, Minn. Tickets are $7 general admission, $5 seniors and group, and $2 for students with ID. Performances are 7:30 p.m. on Thursday, Friday, Saturday, April 14, 15, 16 and 2 p.m. on Saturday, April 16. There will be a public talk-back, with invited respondents, after the Friday April 15 performance; the Saturday matinee performance is ASL-interpreted. Beth Cleary, Associate Professor of Theatre Dance, is directing. For ticket information call 651-696-6359 or go online to Macalester.edu/boxoffice. The Glass Menagerie was Tennessee Williams’s first major play, and its success launched Williams as one of the most significant and influential playwrights of the 20th century. 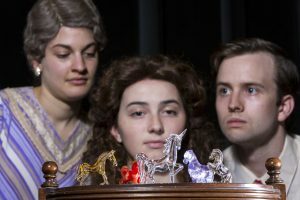 “A memory play,” The Glass Menagerie draws heavily on Williams’s own experience as a son, brother, and young man with a wanderlust. The Macalester production is staging Williams’s preferred version of the script, which imagines projections and live music animating the onstage scenes of economic and emotional hardship. The Macalester production has benefited from a research alliance with the Harry Ransom Center at the University of Texas at Austin, which holds Williams’s correspondence, drafts of published and unpublished plays, paintings and personal effects. Cleary spent time at the Ransom Center’s Williams archives; actors were able to read scenes Williams cut from the final play, see his cross-outs and scribbles — and thereby learn more about the playwright’s process as a shaper of character and story. Cleary has directed plays by Naomi Wallace, Carson Kreitzer, Adrienne Kennedy, Bertolt Brecht and Arthur Miller, among many others. She has also directed in Minneapolis in the Naked Stages Series at Pillsbury House Theatre, and with the Minnesota Jewish Theatre. The Glass Menagerie cast members include: Sasha Hixon ’19 from New York, N.Y., as Laura Wingfield; Melissa Feinman ’17 from New York, N.Y., as Amanda Wingfield; John Stark ’16 from Grinnell, Iowa, as Tom Wingfield; Anna Brujin ’18 from Ten Boer, The Netherlands, as The Writer; Trevor Zapiecki ’19, from Grand Rapids, Ohio, as Jim O’Connor; Bridget Gustafson ’17 from Minneapolis, Minn., as the Stage Manager; Talia Cohen ’19 from Santa Barbara, Calif., as Assistant Stage Manager.